Last September Apple crossed the Rubicon, the iPhone X introducing a new design direction for the company's smartphones. Apple's next generation of biometric security, Face ID allowed Apple to retire the Home Button and move towards its vision to create an iPhone that is entirely screen. Offsetting the loss of the Home Button, a new set of navigational gestures were introduced, which according to Jonathan Ive, is how we will interact with our iPhones for the next ten years. While the iPhone X struck off in a new direction, the iPhone 8 and iPhone 8 Plus refined and polished the familiar design that had evolved over the last ten years to where we are today. That meant Apple has three iPhones in its 2017 line-up as opposed to its usual two, covering two distinct designs. In 2018, yesteryear's flagship design will be retired as two new beautified iPhone models join the family alongside the replacement for the iPhone X. So it’s time to bid the Home Button and Touch ID adieu. So how did we arrive at the names? These are less likely to leak early as it’s well within Apple’s purview, so let's dive in and have some fun speculating, shall we? After all, it's much easier to refer to each device by its name as opposed to screen size. Apple’s iPhone naming convention often included the S designation, and in a one-off, Apple used the C appendage for its plastic-bodied iPhone 5c. While the 9.7-inch iPad is to referred to as "iPad," the higher spec models adopt the Pro nomenclature. Additionally, while unlikely, Apple may stick with the X name. Straight off the bat, we'll skip the iPhone 9 name as it soon crashes into X. 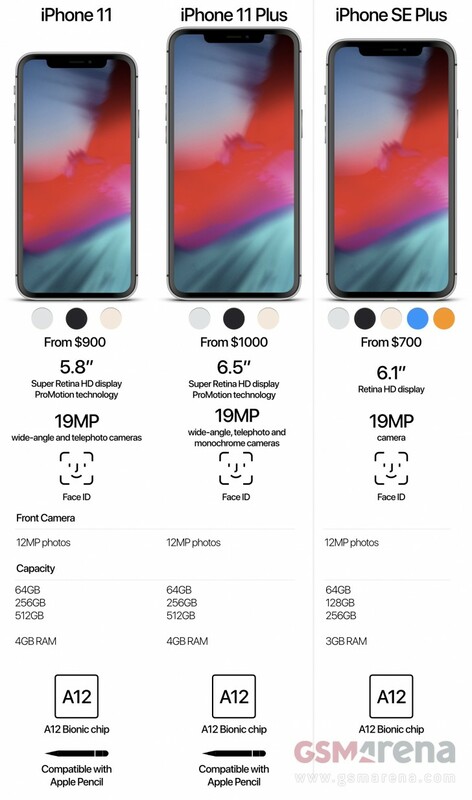 Looking at the list with our Apple marketing hat on - the first two stand out as the most likely options, and for the sake of this argument, we'll use iPhone 11 and iPhone 11 Plus. With that decided, where does that leave the 6.1-inch version? Well, the 6.1-inch variant is believed to be a more cost-effective budget version - something we have heard of before. Exactly, the iPhone SE. We don't for one minute believe that the 6.1-inch variant will replace the SE, the iPhone SE is unique due to both its price and small form factor. Instead, it's not beyond the realm of possibility that the 6.1-inch will join the SE family - hence Apple will introduce the iPhone SE Plus. The replacement for the iPhone X will keep its 5.8-inch 458ppi display and will be joined by a bigger "Plus" sibling with a 6.5-inch 480-500ppi display. These two iPhones will become Apple's iPhone 2018 flagships and will employ OLED multi-touch displays supporting HDR and 3D Touch which Apple markets as the Super Retina HD display. The 2018 flagships will be joined by a new mid-sized variant with a 6.1-inch 320-330ppi display which will continue to use an LCD, Apple markets these as the Retina HD display. While likely HDR-capable, it's been speculated that the 6.1-inch LCD model may drop support for 3D Touch. In order to achieve the iPhone family look for the LCD equipped 6.1-inch iPhone, according to DigiTimes, Apple has been working with Japan’s Nichia who have developed a new kind of LED backlighting technology that will require smaller connectors which it refers to as the 0.3t LED chip. It's these connectors that often dictate the size of the chin on LCD phones. The 0.3t LED chip has smaller connectors than the current 0.4t LED chip resulting in bezel size of 2.0mm-2.5mm. While this new LCD allows a consistent bezel all around, the LCD equipped 6.1-inch variant may still have slightly larger bezels than the OLED equipped flagships. With the 2018 iPad supporting the Apple pencil, does it make sense for Apple to add Apple Pencil support to the 2018 iPhones? Dependent on your inclination, maybe. If Apple does introduce Apple Pencil support, the 6.5-inch could overnight compete with the Samsung Galaxy Note9. Yet in our experience, the Apple Pencil works best when paired with the iPad Pro's 120Hz display. Today's iPad, with its 60Hz display, doesn't have the smoothness to feel right - maybe we've been spoiled by the iPad Pro. Just as we saw True Tone cascade down from the iPad Pro to the iPhone, will we see Apple equip its flagship iPhones with 120Hz displays? We could also envisage this being a popular choice among gamers and potentially Augmented Reality applications. It's even possible that Apple will reserve this for the iPhone 11 Plus to further differentiate its larger model. All 2018 iPhones will continue in the design direction set by the iPhone X with the inevitable subtle enhancements as a result of learning from the iPhone X and advances in manufacturing. While subtle, you'll notice that our renders differ slightly from other sources as we've kept the button layout and positions the same distance from the bottom of each variant - our rationale for this was facilitating ease of reach when using the Home/multitasking gestures. We're less sure of the pull-down gestures though from the top of these taller screens, but we'll know soon enough. Apple will double-down on Face ID in the 2018 iPhones with all utilizing a cutout for the associated Face ID tech, sensors, speaker/microphone and front camera. As the iPhone X introduced the first generation of Face ID, we wouldn't expect a generational shift just yet. That being said, it's rumored that improvements in packaging could result in the size of the notch being reduced. With Apple's commitment to wireless charging, expect the flagship 2018 phones to continue to be constructed with a reinforced glass backside, employing stainless steel between the glass sandwich. If the 6.1-inch iPhone arrives with a glass back, it's been speculated that it will employ aluminum alloy to join the two glass surfaces together. One area where rivals are eclipsing Apple is in their use of color within the glass manufacturing process leading to some stunning colorways. The iPhone X is still only available in Silver and Space Grey finishes, no Product Red edition was launched, and the Gold version spotted at the FCC hasn't seen the light of day yet. 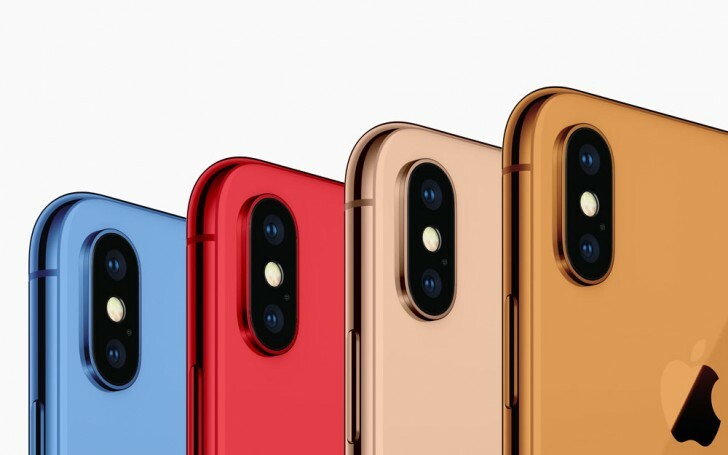 We know Apple can color its glass successfully with its 7-layer color process by the availability of Gold and Product Red finishes for the iPhone 8 and iPhone 8 Plus. Maybe Apple had trouble colorizing the stainless steel. According to TF International Securities analyst Ming-Chi Kuo Apple will finally offer the flagships iPhones in a Gold finish. He even says Apple will offer the 6.1-inch iPhone in a greater range of colors, potentially including Blue, Red, Grey, White, and Orange. We've seen conflicting reports on the exact colors from Makotakara, but the indications are clear - expect more colors. We can't help but speculate that given the challenges Apple seems to have had providing additional color finishes for the iPhone X, the 6.1-inch iPhone could adopt an entirely aluminum enclosure similar to its iPod Touch range, forgoing the glass back and wireless charging - remember, you read it here first. As a minimum we expect the flagships to come with the dual camera system from the iPhone X. Comprising of 12MP ƒ/1.8 regular (in phone terms, that is) and ƒ/2.4 telephoto cameras and keeping the dual optical image stabilization. All this assisted by the Quad-LED True Tone flash with slow sync. In keeping with its more budget status, the 6.1-inch model will use a single lens, as the iPhone 8. Forbes, based on case schematics from Ghostek, reports that the flagship 6.5-inch iPhone could come with a three sensor arrangement. Apple could move to differentiate its largest offering by utilizing a triple lens setup, supplementing the wide-angle and telephoto lens with a monochrome sensor for decreasing image noise and improving dynamic range. We're big fans of the Huawei P20 Pro and as such more than willing to hope Apple go this route. Apple has remained conservative when it comes to its pixel count - it's been at 12MP since the iPhone 6s. Sony, the supplier of iPhone camera lenses, recently introduced the IMX586 a smartphone camera lens with 48 MP Quad Bayer 2x2 pixel array.. On most occasions it will bin four pixels together outputting the equivalent of 12MP sensor with large 1.6 μm pixels. Essentially this is the successor of the 40MP sensor inside the Huawei P20 Pro, which also packs a Quad Bayer arrangement. Publicly Sony has stated that this will begin arriving at smartphones as early as September 2018. It's probably just wishful thinking to assume that Apple will have the opportunity to include the IMX586 in the 2018 iPhone lineup. If Apple does decide to up the megapixel count, Sony has a number of sensors in its Exmore RS range that are suitable, giving Apple ample time to integrate with its ISP and computational needs. That would mean we should expect something in the 16-19MP range. We previously reported that from 2019 Apple could introduce its TrueDepth 3D sensor to the rear cameras to improve AR, provide additional camera effects such as Portrait Mode and allow you to plop an Animoji on an unsuspecting subjects head. There's an outside chance that Apple could introduce this sooner as it doubles down on AR. The front facing, or selfie camera, on the iPhone X is OK at best. As such, we expect Apple to greatly improve upon it in the 2018 range. Even taking the easy route, expect a new 12MP front-facing camera to make the best out of the new Group FaceTime feature in iOS 12. We won't dwell too long on video, but we'd be interested to see the approach Apple will adopt. Some feel the current flagship trend of capturing a small burst 960fps, while fun, actually turns out to be quite tricky to use in the real world. It's still an amazingly cool feature though so we'd love to see Apple come up with its own solution. It's a safe assumption that Apple will introduce the next generation of its venerable A-Series SoC, the A12 and will undoubtedly outfit the two flagships with them. What will Apple use to power the 6.1-inch iPhone? With the A11 Bionic still doing great, would Apple take the opportunity to reduce costs and equip the 6.1-inch iPhone with last year's SoC? We hope not, but you never know. An alleged 2018 iPhone with iOS 12 recently surfaced on Geekbench. We can't be certain of its authenticity, but if we compare its results to previous generations of the A-Series SoC's, then it's certainly in the ball park if maybe a little less than what we were expecting. Also of interest in the Geekbench benchmark was the processor has a base frequency of 2.49 GHz. According to DigiTimes, Taiwan Semiconductor Manufacturing Company (TSMC) has been ramping up volume production of 7nm process in the second half of the year to fulfill lucrative orders from Apple for fabricating A12 chips for its 2018 new iPhone models. It's expected that the A12 will benefit from not only faster performance but a subsequent decrease in power consumption. Of course, the A12 SoC brings a great deal more to the table. Its ISP will bring all sorts of improved camera goodness such as even faster autofocus, pixel processing and hardware enabled multi-band noise reduction. Similarly, the A12 neural engine improvements (A11 Bionic Neural engine is a Dual-core design, capable of real-time processing of 600 billion operations per second) should improve Face ID's performance. The iPhone X with the A11 Bionic was on par with the first generation of Touch ID, and for some, that felt just a tad too slow. It's expected that the A12 SoC will also include Apple's 2nd generation in-house GPU. If the Geekbench results are factual, the performance is again going to be class-leading. We always seem to knock Apple for the amount of storage of RAM within its devices, but we have hope that we'll see the two flagships with 4GB RAM as indicated by the Geekbench listing, while it could increase the maximum storage from 256GB to 512GB. Apple will continue with the two battery setup with this year's flagships, first seen in the iPhone X. The 6.1-inch iPhone is likely to have a single battery. It's been widely reported that Apple is designing its own Power Management chips for all or some of the 2018 iPhones reducing reliance on its incumbent supplier Dialog Semiconductor. Conflicting sources have stated that Apple is set to replace around half of its power management chips in 2018 iPhones while another source noted that the chips might not be ready until 2019. If the chips are ready, expect them to appear in the 5.8” and 6.5” iPhones. Apple’s new chips will handle tasks like battery life management, iPhone charging (linked with AirPower) and energy consumption with advanced power monitoring capabilities (expanding the new iOS 12 battery stats). Last year, by designing its own GPU, Apple managed to cut costs and improve its flagship. If the stars do align, Apple's Power Management chips, combined with a 7nm A12 SoC could see hours added onto the runtime of the 2018 iPhones. Finally, expect Apple to finally launch the AirPower Mat officially. Announced alongside last year's iPhones, we should finally be able to get our hands on one to experience the multi-device charging solution. Speaking of which, the 2017 iPhones wireless charging capped out at 7.5W - and that only after the iOS 11.2 software update. The Qi standard supports up to 15W of charging, however. Will Apple equip the 2018 iPhones with the hardware to hit 15W while coping with the heat build-up and will the AirPower support 15W charging? In our reviews we've been very vocal how very ungenerous of Apple not to include a fast charger with the iPhone's. We expect this to finally be addressed. Apple has been rumored to be working on a beefier 18W charger to include with its 2018 iPhones - at long last. We don't think it's a coincidence that it could be more than capable of powering the AirPower Mat. Analyst Ming-Chi Kuo in April suggested that Apple will be offering a "more aggressive" pricing strategy for its three new iPhones in 2018. We have no additional intelligence on the bill of materials for Apple's 2018 iPhones to speculate on any of the above. We've yet to come across any surprises in the beta's of iOS 12, but every year Apple seems to pull something out of the hat alongside its newly announced iPhones. Be it camera effects such as portrait lighting we highly expect Apple to do the same again this year. Given that both its flagships will now be packing OLED displays we wouldn't be unhappy if Apple finally gave us the dark mode we've been hankering after and the option of an always-on display. So there you have it, our take on the 2018 iPhones. We'll update as the clock ticks down towards their unveiling and new information comes to light. I was hoping iphone new lines will include a sizeable, compact enough phone to be operated with one hand :(.... I will be missed those 5s & SE. To iphone team, Whatever device going to lunch but please be sure to tag competitive prices. POCO F1 is ahead. Do care of your beloved iphone.